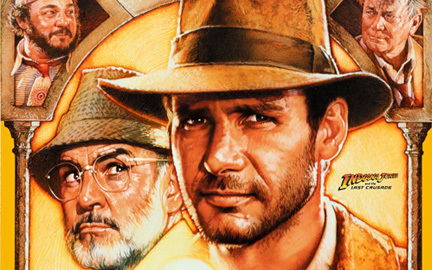 Indiana Jones and the Last Crusade is the third film in the Indiana Jones series. Released in 1989, it was directed by Steven Spielberg. Although it was the third motion picture released, the movie is chapter twenty-five in The Complete Adventures of Indiana Jones. Set two years after the events of Raiders of the Lost Ark, the story follows archaeologist Indiana Jones as he discovers his estranged father has gone missing while seeking out clues leading to the Holy Grail. Guided in his search by his father's diary, Jones learns that the Nazis are also interested in the Biblical cup, and must overcome them to be reunited with his parent. The film starts in 1912 with Indy (River Phoenix) as a Boy Scout in a failed attempt to retrieve the Cross of Coronado from treasure hunters. After stealing the Cross from Fedora and escaping across the countryside on horseback and circus train, Indy returns home, only to have the local sheriff reclaim the Cross for Fedora and his client, Panama Hat. The small adventure inspires his whip, fear of snakes, fedora (and style of dress), and even the scar on his chin.